draw a point of reference in front of the most advanced toe of your foot. measure the length between the most advanced toe of your foot and the back of your heel. It is essential to measure both feet. This corresponds to being able to pass a finger behind the heel when one has the foot in the boot. The mondopoint size allows you to select shoes but should not replace a careful fit. These values are given as an indication, each manufacturer has its own conversion table. A pair of Meidjo binding weighs about 920 grams. Can I release with Meidjo in telemark mode? Yes, in case of fall, the release is guaranteed. It’s carried out laterally via the spring box. In size S, the drilling pattern of the Meidjo 2.1 is identical to that of the Meidjo 2.0. Be carefull in size L, the pattern of the Meidjo 2.1 is different from that of the Meidjo 2.0 in the base plate. At the back of the base plate: two new holes are to be drilled and the two old ones are to be filled. The new holes are aligned with the others for a better anchoring. What is the weight of the alpine heel? The pair of an alpine heel is 240 grams. With which telemark boots, the alpine heel is compatible? At present, only the Crispi brand sells telemark boot with rear inserts: all Crispi boots with inserts at the front have rear insert allowing the use of the alpine heel. If you want Scarpa boots with rear inserts, only models before 2016 are fitted with rear inserts. Warning : Scarpa TX Comp have never had front and rear inserts. Is it possible to use the alpine heel with a binding other than Meidjo? No , it’s not possible to use the alpine heel with a binding other than Meidjo. At your own risk and peril - the release may not trigger. Can I release with the Alpine heel? Yes, in case of fall, if you have the alpine heel the complete release is guaranteed in rotation. The release is effected onto the heel and via the spring box. In the event of a frontal fall, the heel will disengage and the telemark mode will be activated. The complete front release is therefore not possible. 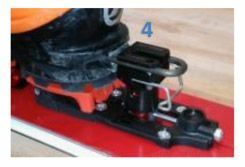 Is it possible to put both ski-brakes and crampon interface? It’s preferable to choose between the use of ski brakes and the use of crampon interface. If you prefer hiking, it is advisable to install the crampon interface. If you prefer the track, it is advisable to install ski brakes. 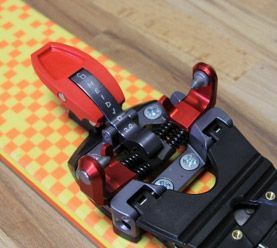 However, if you want to use both options, it will be necessary to install crampon larger than the ski brakes. What are the inserts for? The first function of the inserts is to equip several pairs of ski to change as many times as you want the binding of skis. 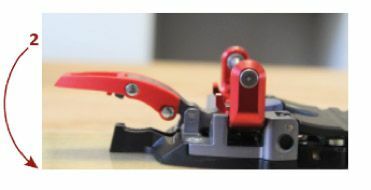 They also have the advantage of preventing the abduction of the binding on condition that choose a ski with some reinforcement (titanium plate, for example). Stop-skis sold before autumn 2017 are NOT compatibles with the Meidjo 2.1. Stop-skis, sold til autumn 2017 are compatible with all Meidjo models. Which skis to choose for telemark? All skis can be used for telemark. It should be noted that the telemark is a sport where the skier exerts a lot of pressure and torsion on the bidings and on the skis. This stress requires to choose solid skis, with a flat heel and preferably stiff. For this reason, we advise you to orient to skis that have a skate reinforcement plate (ideally titanal); you will limit the risk of tearing. We DON'T advise using skis with a paulownia reinforcement. If you have any doubt, you can ask us for advice through our contact form , specifying the brand and model of the skis or contact a specialist dealer directly. Which brands sell telemark boots? Telemark is a market in which 3 brands distribute specific boots for telemark: Crispi, Scarpa and Scott. The choice will be based, above all, on comfort. 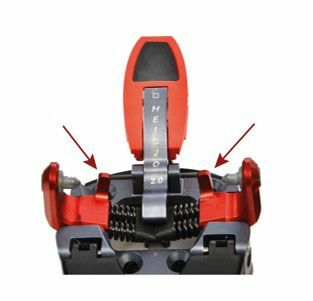 Number of buckles : a three- buckles shoe is used more for touring ski (lighter and lower boots) than a 4- buckles shoe that is more oriented for mountaineering. Two parameters are considered in the flex: the stiffness of the collar and the stiffness of the bellows. For advice and more information on the choice of your telemark boots, we invite you to contact a specialist store. What kind of telemark boots can I use with Meidjo? In order to use the Meidjo binding, it’s imperative to have NTN (New Telemark Norm) standard boots with front inserts. The boots in standard 75 don’t fit on the Meidjo. For more details about the choice of telemark boots, see : Which brands sell telemark boots? Where can I find the documentation / tutorials for mounting, adjusting and using my products? 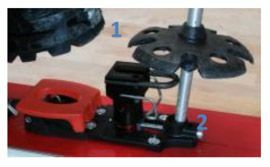 You can find all the documentation in this section https://www.the-m-equipment.com/en/products/documentation. How to step in Meidjo in telemark mode? 1 - "arm" the binding by raising the spring box until the spring box stay upward till the “clic”. 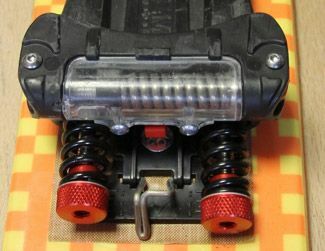 The red stub axle stands the spring box up. 2- Then place the shoe in such a way that the toes of the shoe touch the 2 Easy step In pine situated on the front of the jaws. Press the front of the shoe. When the low tech is locked press down your heel slowly. When you hear a little click lift up your heel one time. When you hear a second click, you are fitted into the binding let's telemark. How to step-in Meidjo in touring mode? Attention: Once you are in touring mode it is impossible to unfit. Always unlock the front lever as soon as you telemark. Not respect this instruction could cause serious injury. How to step-in Meidjo in alpine mode (option alpine heel)? The alpine heel allows you to ski instead of telemark. However, you need to fit the telemark mode before fitting the alpine heel! Be careful not to fit the low tech only and then the alpine heel. The mechanism operates in favorable conditions only if the shoe is held by the telemark mode in the first place, and then by the alpine heel. To get to this setting, you need to place your pole in the hooking pins and to press the tip of the pole against the blocking spring. Then push the pole toward the back of the ski to move backward the hooking pins. This step is detailed in the question "How to fit Meidjo in telemark mode? " Now that you’re in the telemark mode, lift the heel of your shoe (1) so that you can move the hooking pins forward with your pole. 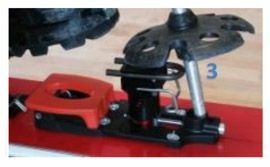 To do so, place the tip of your pole in the small circle (2) and push the side of the tip against the hooking pins toward the ski tip (3). Push your heel downward to fit (4). To return to Telemark, you need to move backward the hooking pins by placing the tip of your pole inside the hooking pins (1), pressing the tip of the pole against the blocking spring (2) and pushing toward the end of the ski (3). 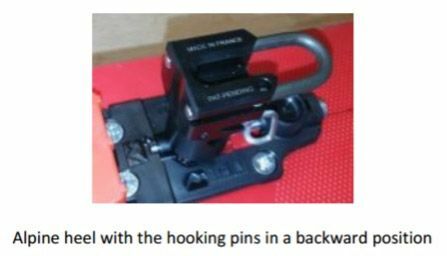 Once the hooking pins are in the backward position, your heel is free and you can Telemark. The unfitting of the binding is detailed in the MEIDJO user guide. How to switch from touring to telemark mode? To return to telemark mode, you have to unlock the springbox and unlock the lowtech. How to step-out with Meidjo? Use your pole to press onto the front lever and reduce pressure onto the toes by rising up the front of the shoe – the jaws will open automatically. Can I test Meidjo bindings? come on a ski test that we organize all winter in France, Italy, Switzerland and the USA. To see the schedule of the ski tests go here. Where can I buy The M equipment products? You can purchase our products from one of our retailers or via our store. Where can I find the spare parts? You can also get closer to one of our dealers. Where can I find the Meidjo 2.1 kits to update my Meidjo 2.0? Where can i find spare parts for meidjo 2.0? Where can I find spare parts for Meidjo 1.0? To order parts that are not available for your Meidjo, please send us a request to this form with the part you want and we will send you a quote. Which precautions should I take before each excursion? It’s necessary to follow the usual recommendations to the practice of this sport and to ski always under control, in function of your capacities and your physical condition, never overestimate your skill. Make enquiries as to the blanket of snow conditions, meteorological conditions and risks of avalanche. Respect the instructions and signals of danger in the zone in which you ski. Observe warnings and cautions in the area in which you operate. How do I maintain my bindings? Your Meidjo bindings come ready to ski and should provide years of performance with minimal maintenance. Salt from roads, dirt and grime all work against the life of a binding. Rinse only with freshwater, if required. Keep solvents and chemicals away from your bindings and skis—they can damage plastics and metal components. If you have any problem please bring your bindings to a THE M Equipment dealer for service or contact us. How to store my equipment? To ensure the durability of your The M equipment produts, we advise you to take care of it as much as possible. LWhen not in use, store the binding in a clean, dry place, put down the springbox and put the low-tech in the closed position to avoid tensioning the springs (see pictures below). When you store or transport it, protect it from bumps or bubble wrap, for example. In addition, check your bindings regularly and check their correct functioning before each sortie. Make sure there is no foreign body in the mechanism. Any foreign body of the binding could case problems in the release. 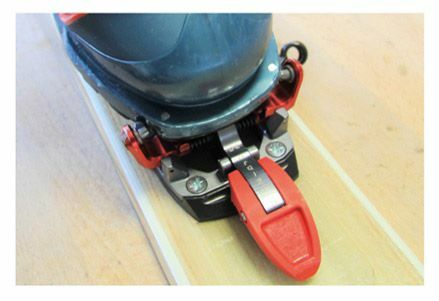 In case of doubt, wear or corrosion, please have your bindings verified by a store registered with The M Equipment. Have your material controlled by a specialized retailer at least once a year, and at the beginning of every season, your whole equipment: skis/shoes/bindings (general state and adjustment of release values). I have a problem with my purchased products, what should I do? If you encounter a problem with The M equipment products and, please contact the store where you purchased your equipment. If this is not possible, please send us a copy of your invoice, photos of the parts concerned and an explanation via our contact form. I am a store and wish to distribute the products The M equipment, how do I proceed? Simply fill out this contact form and we will send you the catalog, prices and the document to open your account. I am a professional : guide, ski instructor ... how can I get a discount on my order? The M equipment offers a discount to all mountain professionals wherever they are located. To benefit from this discount , please send a copy of your professional card and your contact information via this form. Following this, we will send you the procedure to be followed to benefit from it. I’m an athlete and I would like to be an ambassador for The M equipment, what should I do? How can I contact the company if I have a question? You can contact us via our contact form or call us on +33 (0) 9 54 86 73 94 from Monday to Friday. What are the general conditions of sale? I wish stickers The M equipment, how do I get them? How to subscribe / unsubscribe to the newsletter? To subscribe to the newsletter, simply fill in the form at the bottom of the homepage, and then confirm your registration via the mail you will receive in a second time. To unsubscribe to the newsletter, we invite you to click on "If you do not want to receive our new unsubscribe" or "Unsubscribe from this list" at the bottom of the newsletters.